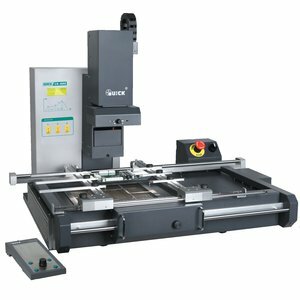 Modern BGA rework systems are complex high-precision tools used for all kind of equipment repair and service. 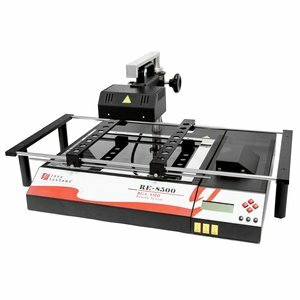 Multi-function semi-automatic infrared BGA rework system with PC synchronization and ceramic emitter for repairing PCBs of Xbox, PS3, laptops, PC motherboards, etc. 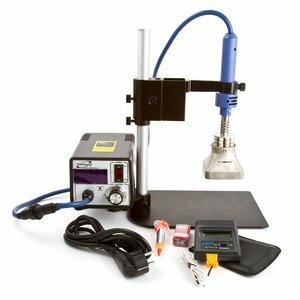 Powerful hot air rework station that combines functionality of hot air gun (400 W), soldering iron (60 W) and IR preheater (400 W). 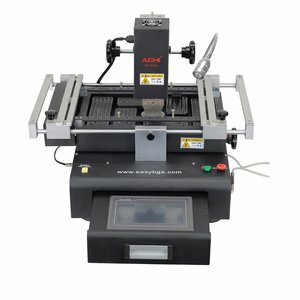 ACHI IR-PRO-SC repair station, designed specially for recovery of huge circuit plates such as motherboards + reballing accessories kit including a reballing station, 10 BGA stencils and solder balls. 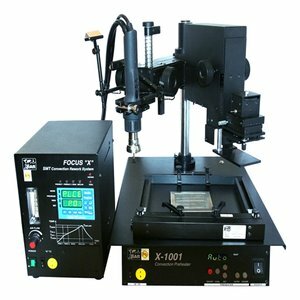 Multi-function semi-automatic infrared BGA rework system with PC synchronization and ceramic emitter for repairing PCBs of Xbox, PS3, laptops, PC motherboards, etc. 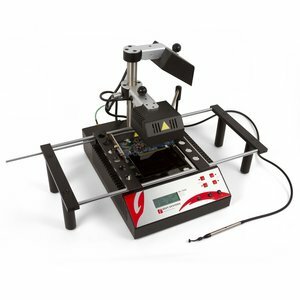 + reballing accessories kit including a reballing station, 10 BGA stencils and solder balls. 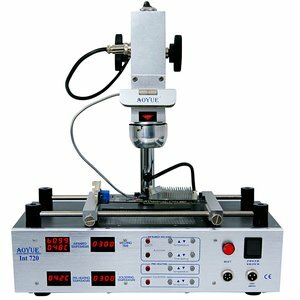 Multi-function semi automatic infrared soldering system with embedded industrial PC. Power: 3650 W. 3 heating areas. 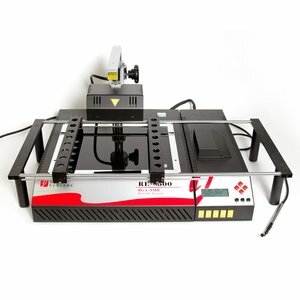 Lead-free BGA repairing system with the increased power (3500 W) for soldering and desoldering various SMT components. All-purpose repair kit designed specially for recovery of huge circuit boards such as motherboards. Two lower preheaters. 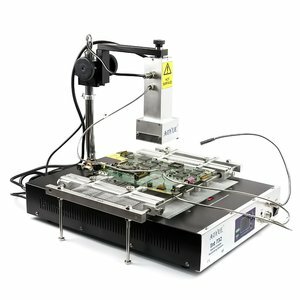 Heating power: 3600 W.
A rework station using dark medium infrared technology for lead-free PCB component soldering and desoldering. Heating process control via software. 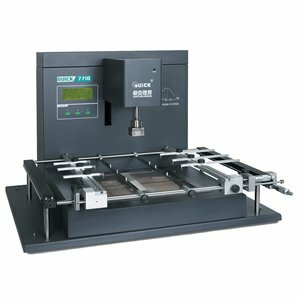 Upper heater power: 300 W, bottom heater power: 800 W.
A Unique, Modular, Digital PID Control SMT Rework/Repair System with integrated Pre-heater, which offers precise and accurate monitoring of process temperatures at a working point on a PCB. 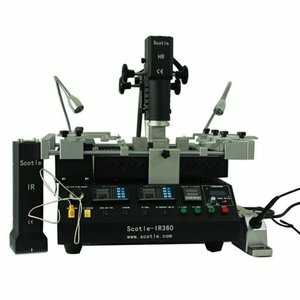 3 in 1 Repairing System that combines the function of an infrared welding tool, a soldering iron and a pre-heater. 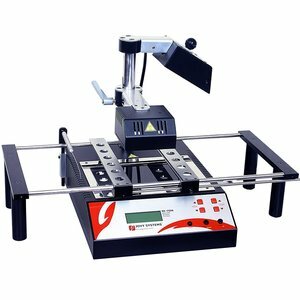 This infrared rework station combines pre-heater suitable for large areas, high powered top-heater, compatible lead free solder iron and uses three temperature sensors. 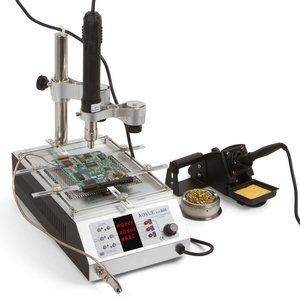 Soldering station for reworking big BGA ICs: ideal for gaming consoles motherboards (Xbox 360, PS2, PS3, PSP, WII), PC motherboards and others. 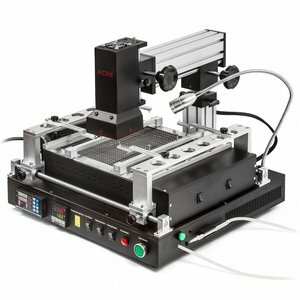 Semi-automatic infrared BGA rework system with a ceramic emisor and PC synchronization. 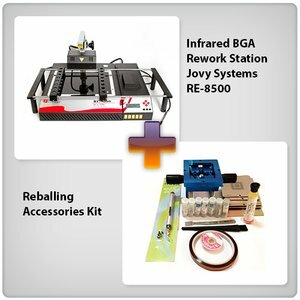 Reballing accessories kit includes a reballing station, 10 BGA stencils, solder balls, etc. A rework station using dark medium infrared technology for lead free PCB component soldering and desoldering. Interfaces through USB with RE Jovy Soft, PC software that helps monitor the rework process. 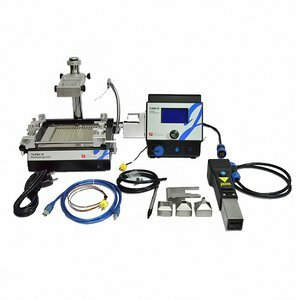 Reballing accessories kit includes a reballing station, 10 BGA stencils, solder balls, etc. 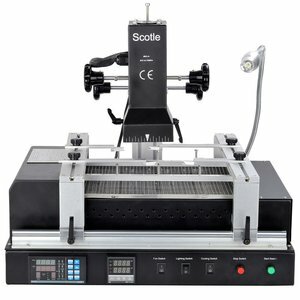 All-purpose repair kit, designed specially for recovery of huge circuit plates such as motherboards. Two lower preheaters. 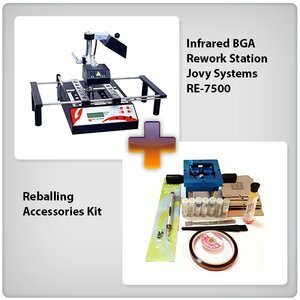 Reballing accessories kit includes a reballing station, 10 BGA stencils, solder balls, etc. 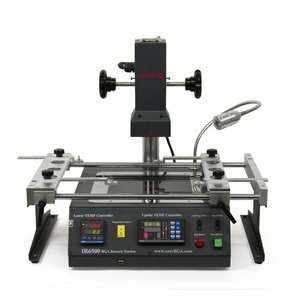 Powerful all-purpose rework station, designed specially for recovery of large PCB's such as motherboards. 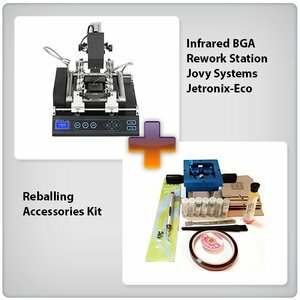 Rework station, designed specially for recovery of huge circuit plates such as motherboards + reballing accessories kit including a reballing station, 10 BGA stencils and solder balls. Powerful rework station which combines infrared and hot air heating technologies. Suitable for reworking of SMD, BGA, CBGA, CCGA, CSP, QFN, MLF, PGA and other components. 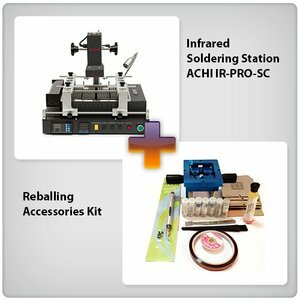 Multipurpose 3-in1 soldering station, a combination of a hot air rework station, an infrared rework station and a soldering iron. Capable of reworking of SMD, BGA, CBGA, CCGA, CSP, QFN, MLF, PGA and other components. 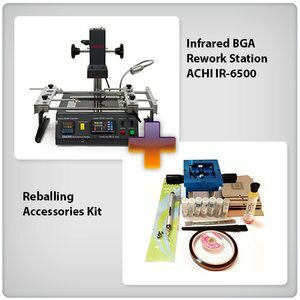 A rework station using dark medium infrared technology for lead free PCB component soldering and desoldering. Interfaces through USB with RE Jovy Soft, PC software that helps monitor the rework process. All-purpose repair kit, designed specially for recovery of huge circuit plates such as motherboards of Sony PlayStation 3, Sony PlayStation 4, Xbox 360. Two lower preheaters. Multi-function micro-processor controlled infrared BGA rework system with PC synchronization and ceramic emitter for repairing PCBs of game consoles (PlayStation, Xbox, etc. ), laptops, PC motherboards, etc.